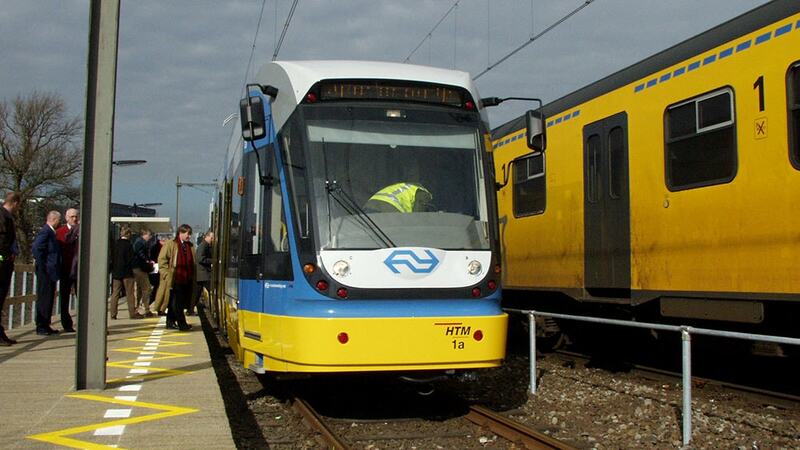 The Province of South Holland is preparing a test with light rail between Gouda and Alphen a/d Rijn. This connection runs right behind my house. The test will last about three years and be split into the following phases. Preparatory phase of technical research (end-2001- autumn 2002) The different safety issues with regard to light rail (material, infrastructure and joint use with heavy rail) will be examined and tested in this phase, so that solutions can be implemented safely and controllable. Operation experiment – traveler transport at increasing frequency (autumn 2002 – end-2004) NS Reizigers B.V. will implement the experiment with light rail operation in this phase using modern light rail equipment. Initially, passenger transport with modern light rail equipment will be put in on the current timetable on Sundays, instead of the current slow (multi-stop) trains. The next step will see the introduction of light rail on other days jointly with the current slow trains to increase travel frequency. A test which will result in tangible results for light rail, with the use of modern material, in the near future (approx. 12-18 months) requires an interactive learning and fine-tuning process with all relevant parties. The choice has been made to mobilise knowledge and expertise from industry, transporters and related specialist organisations in a practical and phased approach for the light rail test in the province of South Holland. This bottom-up approach aims to be supplementary to and speed up understanding with regard to the existing, more theoretical approach of the safety issue in particular, as laid down in the Dutch Framework on Light Rail Safety (Nederlandse Normenkader Veiligheid Light Rail). The bottom-up approach will provide concrete results for certain (safety) solutions via measurements, making actual testing of the safety standards possible. The test will provide knowledge and expertise with regard to light rail and break through the deadlock that has existed for some time now with regard to obtaining concrete information on safety and joint use of light and heavy rail. Other (future) light rail initiatives in Europe will benefit from this.